Applications Of Thermal Analysis And Calorimetry In Adsorption And Surface Chemistry (Philip L. Llewellyn). The Applications Of Thermoanalytical Techniques To The Preservation Of Art And Archaeological Objects (Marianne Odlyha). The Application Of Thermal Analysis To The Study Of Carbons (Pauline Phang And The Late David Dollimore). Applications Of Thermal Analysis In The Preparation Of Catalysts And In Catalysis (B. Pawelec, J.L.G. Fierro). Ceramics, Glass, And Electronic Materials (Patrick K. Gallagher, John P. Sanders). 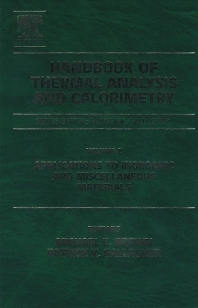 Thermal Analysis Of Clays (Katherine S. Meyers, Robert F. Speyer). Energy Storage (Takeo Ozawa, Masayuki Kamimoto). The Thermal Stability Of Explosives (Jimmie C. Oxley). Fossil Fuels - Application Of Thermal Analysis Techniques (Mustafa Versan Kok). General Inorganic Chemicals And Coordination Compounds (H.J. Seifert). Applications Of Thermal Methods In The Geosciences (Werner Smykatz-Kloss, Klaus Heide And Wolfgang Klinke). Dehydration Of Crystalline Hydrates (Andrew K. Galwey). Thermal Analysis In Metallurgy (Shaheer A. Mikhail, A. Hubert Webster). Pyrotechnics (E.L Charsley, P.G. Laye andM.E. Brown). Thermal Analysis In Studies Of High-Tc Superconductors (J. Valo and M. Leskelä). Provides an appreciation for how thermal methods can be applied to inorganic materials and processes. Provides an insight into the versatility of thermal methods. Shares the experiences of experts in a variety of different fields. A valuable reference source covering a huge area of materials coverage. Thermal analysts in academia (universities, colleges) and industry, and graduate students in the field of thermochemistry and thermal analysis.